TORONTO, Jan. 25, 2018 /PRNewswire-HISPANIC PR WIRE/ – Scotiabank has been recognized by Junior Achievement Americas (JA) as the winner of the 2017 Transforming Education Award, the maximum recognition that JA gives to its partners at the regional level. 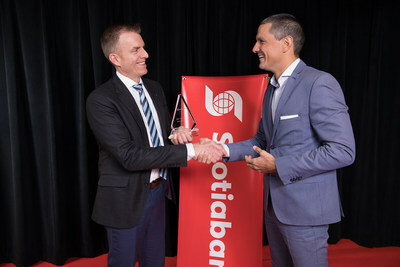 Brent Currie, Scotiabank’s Senior Vice-President of Brand Management and Marketing Services, received the award in Toronto, Ontario. Junior Achievement Americas has recognized Scotiabank for its ongoing support over the last eight years, allowing JA to not only impact the lives of thousands of young people in the region, but to generate innovations to remain relevant in the face of the needs of young people and the labour market. That is, digitalization of the content of the JA Economics for Success program, the development of the first Regional Online Innovation Camp of JA Americas, and the Road to Success initiative launching. Scotiabank’s CSR priority to invest in young people has been reflected through the Bank’s partnership with Junior Achievement Americas, allowing students from 14 to 18 years of age to participate in national innovation camp competitions that aim to find innovative solutions to specific challenges that the business world faces. Similarly, the Road to Success program aims to help develop the infinite potential of youth in our communities by teaching kids the basic concepts of financial literacy. The initiative will continue to give students a basic understanding of the principles of finance and practical advice on budget planning and money management. As part of one of the world’s largest youth-serving NGOs, JA Americas activates youth for the future of jobs. Through the delivery of hands-on, blended learning in financial literacy, work readiness, and entrepreneurship, we empower young people to grow their entrepreneurial ideas, hone their work skills, manage their earnings, and secure better lives for themselves, their families, and their communities. With 31 countries, the JA Americas network is powered by over 38,000 volunteers and mentors, who serve more than 1 million young people each year. More information at www.jaamericas.org.